There is no worse experience than running out of gas while you are mowing your lawn. When this happens, you must drop everything and drive to the gas station. It would be nice to have a safe spill-proof gas can for this situation. 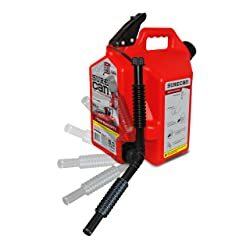 Take a look at the best gas cans we have found for 2019. 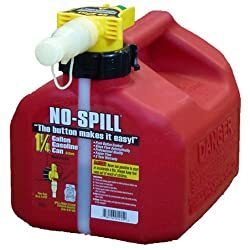 If you need to get gas for your lawn mower, then you want to have a gas can that will not tilt over and spill in your car. The last thing you need to worry about is cleaning up a gas spill! We have listed below our favorite gas cans for your review. This is one of my favorite gas cans because it has a thumb button control that gives you more accurate pouring. It has a funnel spout that is only ⅞-inch wide for filling even the smallest equipment. The No-Spill gas can contains a stainless steel mesh screen to prevent contaminants from getting into your tank. It can hold up to 2.5 gallons of gas and stops flow automatically when the gas tank reaches a full level. This gas container has a patented self-sealing, self-venting nozzle. Gas flows at a rate of 3 gallons per minute from this can. Quart and liter markings on the side of the can and a clear viewing stripe allows you to see how much gas remains in the can.The 3-year warranty on this product makes this gas can a great option for your lawn mower needs. The SureCan gas can will hold up to 2.2 gallons of gas. It measures just over 12-inches in height and 9-inches wide. Its patented spill-proof technology makes sure you don’t spill gas all over your feet while filling your lawn mower! This gas container has a rotating nozzle and a thumb-release trigger which allows gravity to dispense fuel from the bottom of the can. This means you no longer have to bend over to tip your gas can. The nozzle self-ventilates and has a child-proof cap to protect your little ones. WIth a 1-year warranty, this SureCan gas can is the right choice for your lawn mowing needs. This No-Spill gas can is a great solution for smaller lawn mowers. It will hold 1.25 gallons of gas and has a thumb button which allows you to control the flow of the gasoline. The diameter of the funnel spout is only ⅞-inch and will fill even the smallest piece of equipment. 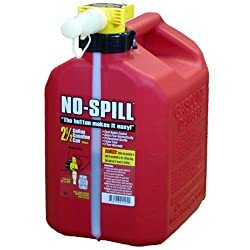 The No-Spill gas can has an attached dust cover to keep your funnel spout clean. An integrated mesh stainless steel screen inside the container prevents unwanted debris from getting into your lawn mower. This gas can has one of the fastest pouring spill-proof nozzles delivering up to 3 gallons of gas per minute. This No-Spill product comes with a limited 3-year warranty making this a smart option for your lawn mowing needs. The Eagle red gas can is durable and easy to use. It is constructed of 24-gauge hot dipped galvanized steel with a double interlock no-weld bottom seam. It has a baked on bright red powder coat finish. Made in the USA, this gas can has a yellow funnel with a spring closing lid. The neoprene gasket around the lid vents at 5 psi (pounds per square inch) internal pressure. The Eagle gas can holds up to 5 gallons of gasoline. It has a non-sparking flame arrestor and brass pour spout. This Eagle gas can is a Type I safety can. This means it has only one opening in the can. You pour and fill from the same opening. 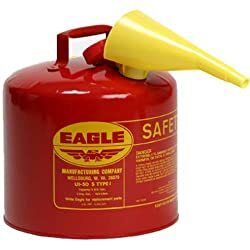 This Eagle Type I safety gas can is one of the safest gas cans you can store in your garage or shed with your lawn mower. This container meets OSHA (Occupational Safety and Health Administration) and NFPA (National Fire Protection Association) requirements. 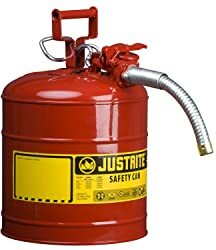 This Justrite gas can is a great choice if you want a Type II safety gas can. A Type II gasoline container has two openings in the can. One opening is for pouring and the other one is for filling. The fill opening acts as a vent when pouring gas from the can. This gas can has a large label area where you are able to write the contents that are inside. This is a safety feature that avoids misuse of the contents. The Justrite can has a stainless steel flame arrestor which protects against corrosion. A squeeze trigger is on top of the gas can for accurate control of gasoline flow. The self-closing lid controls vapors and prevents spills. This gas can has a 1.68-inch pour hole. The Briggs & Stratton Smart-fill gas can holds just over 1 gallon of gasoline. 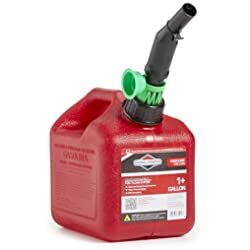 To pour gasoline, you twist the green safety collar on the gas can, rest the spout anchor on the lip of the tank you are filling, and push down to start the flow of gas. The spout automatically stops once you release your downward pressure. The Smart-Fill spout will keep your fuel and flames contained. A dust cap on the top of the nozzle keeps dirt and other contaminants out of the gasoline. This gas container provides illustrated instructions on the side for how to use the can. It is EPA and CARB compliant. This bright red gas can has a comfortable top handle and back grip for ease in carrying and pouring. The gas can holds up to 5 gallons of gas and it won’t rust or dent. It is great for some larger pieces of equipment such as a riding mower or generator. The Midwest gas can meets the CARB and EPA requirements for portable fuel containers. If the gas can tips over, the spout will automatically close with an airtight seal. This is a safe gasolene can option for your lawn mower and equipment needs. It is important to choose a gas can that is the right size for your needs and provides safety from fumes, spills and other dangers. There are many other features you want to consider before you buy a new gas can. We have provided some tips on what to watch out for when reviewing gas cans. If you live in the USA, then you want to choose a gas can that meets EPA requirements. The EPA has provided strict specifications for gas can design. These specifications minimize air pollution and provide features that improve safety. Other countries and states have similar types of regulations that require compliance for gas cans. Be sure to know what your area requires before you buy a gas can. Red containers store gasoline and other highly flammable liquids. If you are buying a new gas can, be sure you are selecting a red one. This will indicate to everyone that the contents of the container are flammable. Try not to store gas for long periods of time. You should use gas fairly soon after you buy it. If you have gas left in your gas can at the end of the summer, you may need to mix in some additives with the gasolene to ensure that it remains fresh. You want to consider buying a gas can that is the proper size for your lawn mower needs. It is nice to have some extra gas in reserve so you do not run out while you are cutting grass. I like to keep a 2 gallon gas can in my garage so I always know I will have enough gas to mow my lawn. Consider the size of your lawn and type of lawn mower when deciding how large of a gas can you need. There are pros and cons of both plastic and metal gas cans. Plastic gas cans are light and easier to handle than metal gas cans. They also will never rust and leave ugly marks on your garage floor. The downside of a plastic can is that it can melt when exposed to extreme heat. This can create a serious danger of explosion. Metal gas cans are heavier and harder to lift for pouring. Metal cans may build up pressure under extreme heat which can lead to an explosion. The possibility of rust from a metal can is likely. You can find gas cans with a non-corrosive treatment applied to the container that reduces the risk of rust. The choice of plastic versus metal is a personal preference. You should pick the type that addresses your specific concerns. 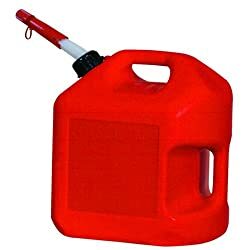 A gas can is a lifesaver when you run out of gas in your lawn mower. As you have learned, there are many features to consider when buying a gas can. After reading our product reviews and features of gas cans, you should be able to buy the right gas can for your lawn mowing needs.